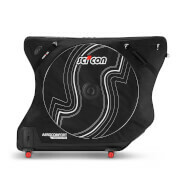 The Scicon AeroComfort Road 3.0 TSA Bike Bag protects your bike from damage when travelling abroad on cycling trips. 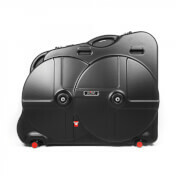 Lightweight and comfortable to transport, the cycling case is the number one bike bag in the world and has been tried and tested by professional road cycling teams including Cannondale, Trek Factory, Cannondale-Garmin, Tinkoff-Saxo and many more. Scicon have updated their iconic road bike bag to include advanced material, increased protection and thru axle compatibility. The added levels of protection blend rigid protection shields to critical areas with reinforced and cushioned shell materials. Thru axle ready, the multi-axle adapter system enables the bag to house quick release and thru axle skewer systems. Designed in collaboration with innovation partner TENTE, the durable Twin Wheel System improves rolling performance and manoeuvrability. Eight precision ball bearing wheels rotate 360° to keep the bike bag upright and easy to manoeuvre over any terrain. A detachable strap system also ensures the bag is comfortable when carrying. A lateral hub shield and layered HD foam padding protects the wheel hubs from jolts and knocks during transit by deflecting and absorbing impacts. 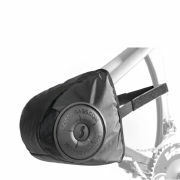 The bike bag has built-in protection for the rear derailleur from impacts and abrasions during the transit of your bike. An internal frame stand keeps your bike in place to protect your bike from impacts, while also enabling customs to inspect your bike without the need to remove anything. Compatible with 12mm front and rear thru axles, the Aerocomfort 3.0 road bike bag includes four thru axle to quick release adapters.